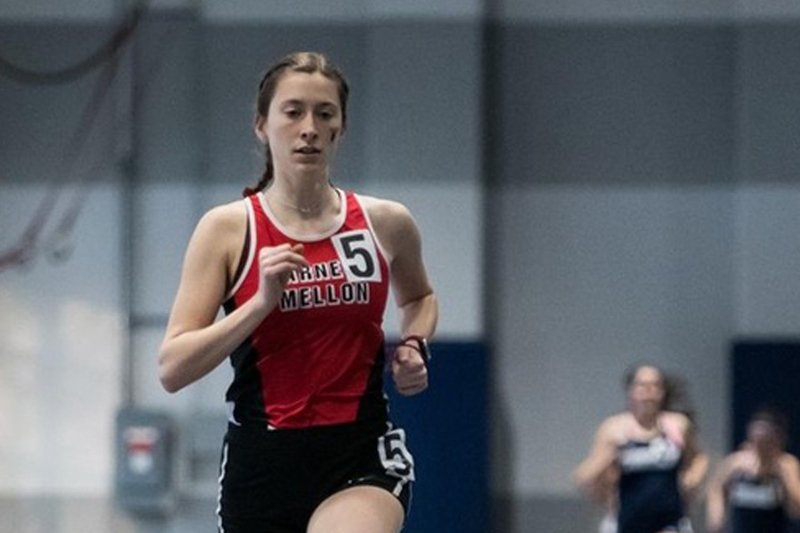 Bhanja, who is graduating with a degree in neuroscience with a concentration in neurobiology and a minor in biomedical engineering, is hoping to end her undergraduate career strong in the classroom and as a captain of the women's track and field team. Her ultimate goal is to become a doctor, and her work at CMU as a student-athlete, researcher and volunteer is part of her journey. The Bachelor of Science in Neuroscience is a joint program between the Dietrich College of Humanities & Social Sciences and the Mellon College of Science. Learn more. "I'm really excited for the course load I'm taking this semester," said Bhanja, whose classes include topics such as biochemistry of the brain, engineering and analysis of complex disease models and introduction to parallel distributed processing. "On the track, I'm looking forward to a season of great competition, personal records and pure fun." 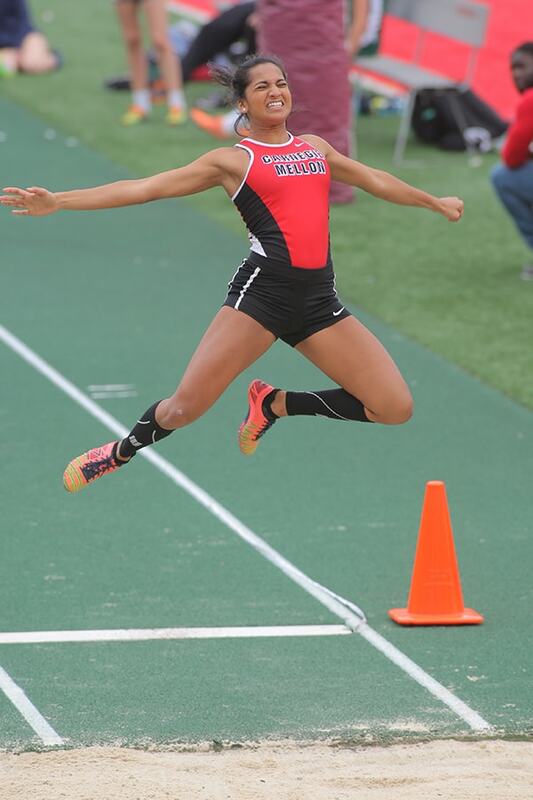 Bhanja holds or has tied four school records in track and field events, including the 100-meter sprint record of 12.48 seconds she set in 2018, and she hopes to improve on her running times and jumping distances this year. 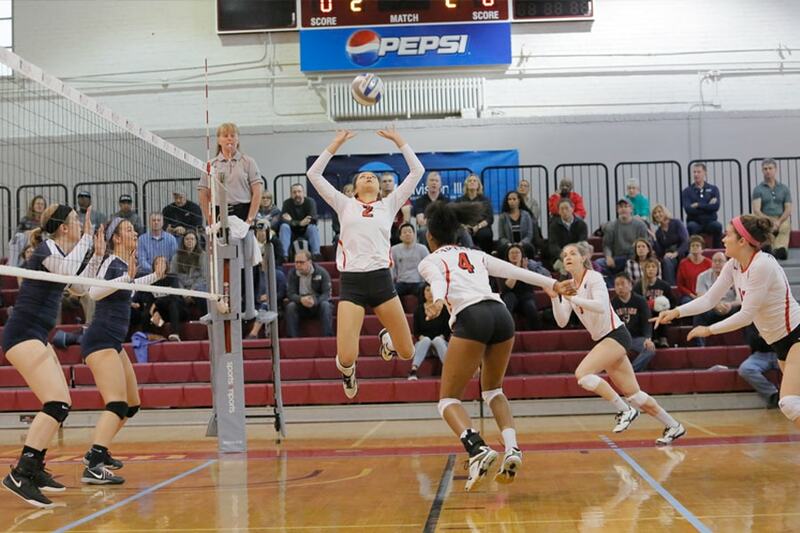 "I am excited to compete and improve as much as I can before the end of my college campaign. I hope for some podium performances in individual events and relays at the UAA [University Athletic Association] Indoor and Outdoor Championships, and hopefully a school record in the 200-meter dash." CMU placed fourth at the UAA Outdoor Championships last year. Bhanja hopes to help the Tartans improve on that finish this year at the UAA meet in April at Emory University in Atlanta. "The UAA is incredibly competitive, which makes the experience there that much more rewarding and honorable," Bhanja said. "We're usually in peak shape during this time so there are always some incredible wins or record-breaking times from my teammates." Head Track and Field Coach Gary Aldrich said the level of athleticism on the track team has risen since Bhanja joined the team. "Two of the past three years have been the best years in the history of the women's track and field program," Aldrich said. "She's a major reason that occurred and a lot of our success this year will be on her shoulders. It's how she learned from the others who came before her and she's now passing that torch on. That's the kind of person she is." Bhanja said former team captain and Mellon College of Science alumna Sarah Cook set the bar high for her to follow. "She guided me through my first three years of undergrad, academically and athletically," Bhanja said. "I try my best to pay it forward to younger members on the team as well as to underclassmen in MCS through my work in academic development." Bhanja tied CMU's long jump record in 2016. 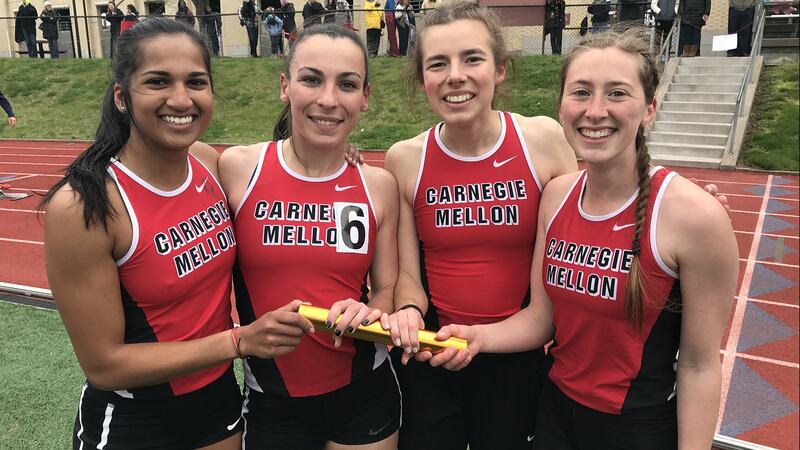 From left, Debi Bhanja, Sarah Cook, Valerie Reiling and Rose Ciriello set the school record for the 1,600-meter relay at the 2018 UAA Championships with a time of 3:57.16. Jason D'Antonio, assistant teaching professor and director of CMU's Health Professions Program, encourages students to take some time to pursue other interests between undergraduate studies and beginning medical school. "I can think of one reason to go right to medical school," D'Antonio said. "But I can think of 100 reasons to take a year or two between programs. It gives students the opportunity to experience and meet people in medicine, health care and biomedical research, and people tend to be a little more relaxed during the application process." Bhanja is planning to do just that. "If all goes according to plan, I would be looking at admission for fall of 2020. I am really happy with my decision to wait until my senior year to apply to medical school because all of my work from undergrad will contribute to my application," Bhanja said. "Also, it gives me one year to pursue anything that I am passionate about before I start medical school and the long journey to become a physician." Complementing a full schedule during the school year, Bhanja has taken advantage of summer research internships in Los Angeles, New York City and her hometown of Columbus, Ohio. She's worked on several projects, ranging from research on diseases such as mesothelioma to African Sleeping Sickness to the health care industry and opioid addiction. "As a student-athlete, it's crucial to make the most of your summers during undergrad," Bhanja said. "Being a Carnegie Mellon undergraduate is such a privilege because we are in high demand." During her sophomore year she had a research fellowship while school was in session funded by the National Science Foundation and is interning this semester with Biomotivate, a Pittsburgh-based start-up creating wearable devices that use machine-learning algorithms to assist patients with opioid addiction. 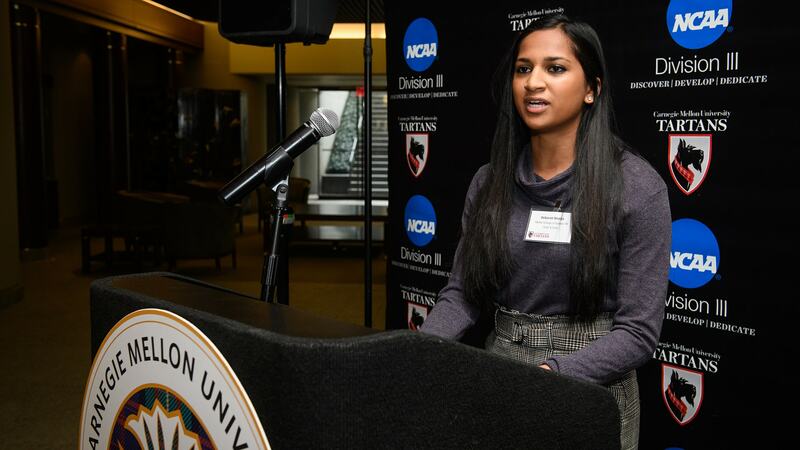 Debi Bhanja was a student speakers at a university celebration honoring 32 upperclass student-athletes las fall. She spoke about the persistent goal-setting that takes place among student-athletes. Additionally, Bhanja found time to serve as president of CMU's Kappa Alpha Theta chapter in 2018 and has looked for ways to bring Greek Life and athletics closer together at CMU. More than a third of Kappa Alpha Theta members are current or former varsity athletes. "I really developed the qualities of vulnerability and empathy," Bhanja said of being in charge of the sorority. "I learned that being able to relate to people goes a long way in leadership and how people perceive you as a leader." Bhanja's ability to be involved in so many activities is a testament to her time management skills. D'Antonio said Bhanja is intentional about how she spends her time. For the past two years, Bhanja has served as a Supplemental Instructor/EXCEL Leader for Honors Modern Biology, co-taught by D'Antonio and Becki Campanaro, an assistant teaching professor in Biological Sciences. As part of her role she reviews course content with the professors and hosts study sessions for students. "Debi always puts time into our interactions," D'Antonio said. "She's thinking about medicine and science, and always seems to be thinking on multiple levels. It's people like Debi who make teaching at CMU much more fun." Aldrich praised Bhanja's time management skills. He said often for seniors, coursework and finding a job can take precedence over the team. "The key is to create a roadmap and get to that goal, and Deb has figured out how to find that roadmap," Aldrich said.